As promised, the NSW Industry Forum: Young People and the Arts is now live so be quick to book your place! Theatre Network NSW (TNN) is partnered with Theatre Network Australia (TNA), Australian Theatre for Young People (ATYP), Polyglot, Create NSW, Sydney Opera House and Currency House to present an industry forum that continues the conversation around Sue Giles’ recent Platform Paper, ‘Young People and the Arts: An agenda for change’. 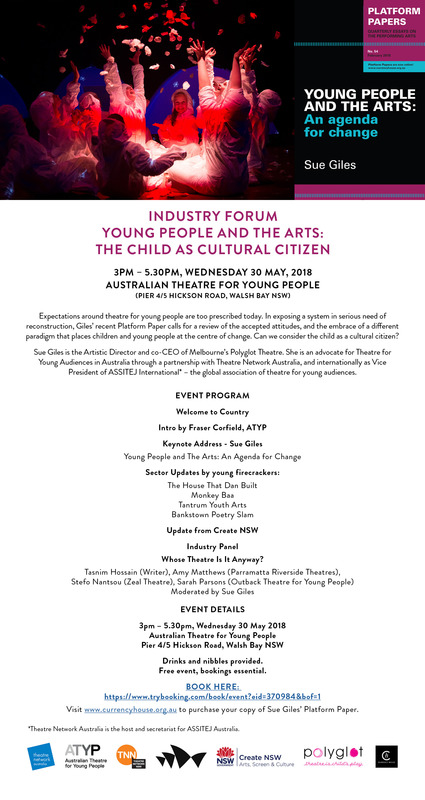 Program includes NSW industry panel, updates by young NSW firecrackers and keynote address by Sue Giles, author of Currency House Platform Paper 54 ‘Young People and the Arts: An agenda for change’. Where: Studio 1, ATYP, The Wharf, Pier 4/5 Hickson Road, Walsh Bay NSW. Cost: Free but places are limited – book now! Platform Papers will be available for purchase on the day. TICKETS: Free event, bookings essential.